The process of manufacturing springs with mechanical spring machinery to create springs by coiling, winding, or bending the spring wire into the shape of a specific spring. Spring manufacturing is an artistic craft that involves specific knowledge in spring making. It encompasses all types of springs. On this page you will learn what spring manufacturers do to make springs and the processes and methods they use to accomplish their artistic spring making craft. This process is done using a Spring Coiler or CNC spring coiler which is a mechanical spring making machine. 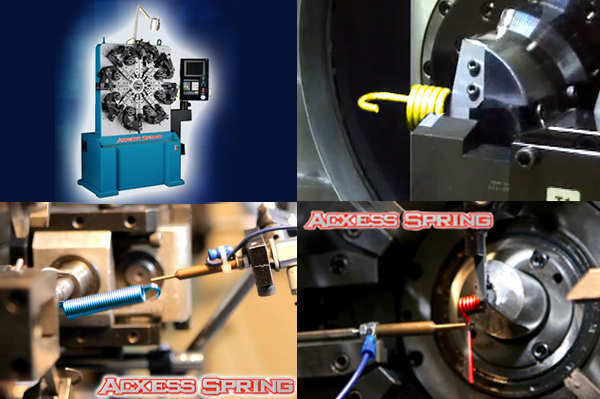 The spring technician performs what is known in the industry as a "set-up" on the machine to prepare the spring machine for creating a specific type of spring. This type of spring machine is used to make compression springs, extensions spring and torsion springs. This process involves feeding the wire into a set of rollers that pulls the spring wire into the wire guides then comes into contact with a coiling point or points which coils the wire backwards forming it into a coil or a pigtail, thus the term "coiling the spring" was born. Please see the picture to the right for a visual explanation. This process is done using a spring former or CNC spring former machine which is also a mechanized spring making machine. This type of machine is used to make tension springs, torsion springs, double torsion springs and wire forms. Spring manufacturers can use it to make compression springs but is is not efficient for that. The difference from a spring former machine versus a spring coiler is that the spring former has 6 to 8 tooling slides on the face of the machine enabling it to perform various bends, loops hooks,radius and various wire shapes on the ends of the springs or on the wire form itself. It is a extremely versatile machine. Please see the picture to the right for a visual explanation. 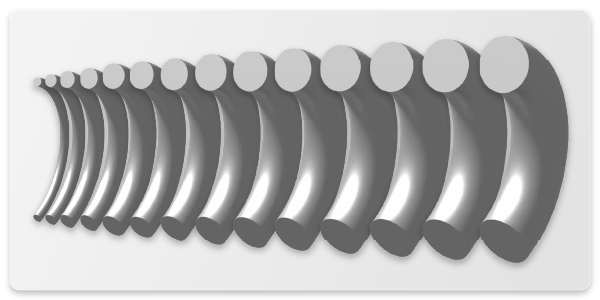 This process uses a CNC wire bender which is computer numerically controlled mechanical wire bending machine. The Wire bender is used to manufacture wire forms. This machine feeds the wire into a set of rollers that pulls the wire into the wire guides then pushes it into a movable tooling head. This tooling head can be made to perform bends, u-shapes, radius, zig zags as well as a large variety of other wire bends. The innovative feature of this machine is that the tooling head can swivel and rotate 360 degrees meaning your wire form can have bends on many different planes. Please see the picture to the right for a visual explanation. When springs are manufactured they need to be stress relieved (heat treated) so the spring can retain its memory. With out heat treating the springs will not hold their elastic shape and not have the bounce we require from the spring. For this reason a spring manufacturer must heat treat or stress relieve every spring manufactured . When heat treating a spring the spring manufacturer must heat treat the spring to a specific temperature for a specific amount of time according to the type of spring wire they use. For example if the spring was made out of music wire then the proper stress relief or heat treat would be 500 degrees fahrenheit for 30 minutes time, if the spring is made out of 302 stainless steel the proper heat treat is 600 to 650 degrees fahrenheit for 30 minutes time. The most modern equipment used is a conveyer belt oven. This oven is placed next to the spring machine so the springs come down a slide and fall into the mouth of the conveyer belt oven. The springs move along the conveyer belt into the furnace section of the oven getting the proper heat treat, then come off the convey belt on the other side and fall into a receiving box for cooling down. Spring wire is used to manufacture springs. This spring wire on a hardness scale is very hard. Typically on the hardness scale their is 1/4 hard, 1/2 hard, 3/4 hard and full hard. With spring wire it is above full hard meaning it is a very hard material. The reason is that spring wire needs to have memory to be elastic so it can bounce back to it's original length. The tensile strengths of spring wire can be found on our properties of common springs material pageproperties of common springs material page. Hard Drawn Wire ASTM A227 Medium carbon steel used in commercial products like toys, pens, indoor use. Music Wire ASTM A228 High Carbon Steel used in exercise equipment, lawn and garden, tools etc. Stainless Steel 302 ASTM A313 Stainless steel used in marine products, medical devices, outdoor use. Stainless Steel 316 ASTM A316 Stainless steel used in medical products, earrings,non magnetic applications. Stainless Steel 17-7PH ASTM A313 High tensile strength stainless steel corrosion resistant and used in high temperature environments. 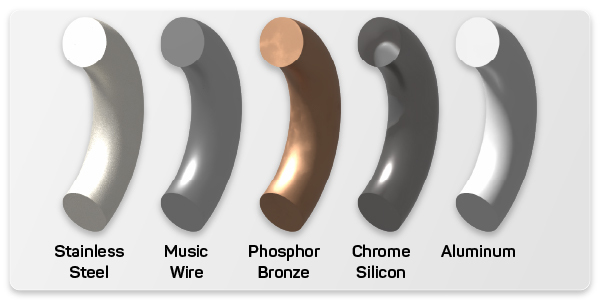 Phosphor Bronze Grade A B159 Non ferrous alloy wire. Good corrosion resistance and electrical conductivity. Chrome Silicon ASTM A401 High Strength Alloy steel wire used for shock loads and slightly elevated temperatures. Spring grinding is when the ends of a round wire compression or coil spring is ground flat so the spring can stand up vertically straight. Many round wire compression or coil springs have a small out diameter and they need the grind so that the spring stands erect and does not wobble. This process is whats referred to as "closed and ground ends" on a compression or coil spring. It is where half the wire on each end is ground off so that the ends are flat and the springs is able to stand up straight. The process of spring grinding is accomplished by an spring grinder. The spring grinder has two (2) horizontal grinding wheels than are spaced apart to permit the length of the spring to enter between both grinding wheels. Then the spring dish is a separate plate that has holes to accept the spring. (see picture on the right). The springs are placed in the holes of the spring dish and the spring dish moves at a very low rate of rpm's. The springs enter in-between the two grinding wheels and the ends of the spring are ground off. Once the grinding is done the spring dish moves the spring around then falls out go the spring dish into a receiving box. Spring plating is the process where a coating or a thin chemical film is applied to cover the spring wire to protect it from corrosion or the elements like moisture or humidity. Certain coatings like copper plating are used for electrical conductivity on springs for battery contact springs. Visit our spring services page for more details. We encourage you to contact us for your spring manufacturing needs.